Championship Semifinals Blakely's Dwarves vs. Brook's Ravenwood. Ironically Blakely and Brook had the 2 and 3 slot respectively, so did a rematch of their round 4 game. I recall the Dwarves having a catastrophic failure: Axemen engaged the Treant knowing that the Antonians would flank-pinch 2 turns later. 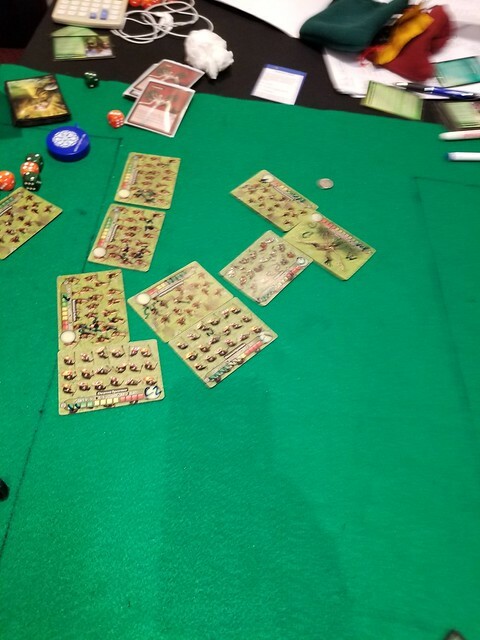 Then they took 4 damage on the charge turn and routed despite a courage-booster Rune card. The Treant then engaged the Antonians one-on-one with predictable results. Pretty much no way to recover from that. Ravenwood has 3 Archers and Treant behind 4 Swordsmen. The Dwarf line (background to foreground): Axemen, Spearmen, Spearmen, Longbeards, Spearmen, Spearmen, plus Antonians in the rear. Re: Championship Semifinals Blakely's Dwarves vs. Brook's Ravenwood. 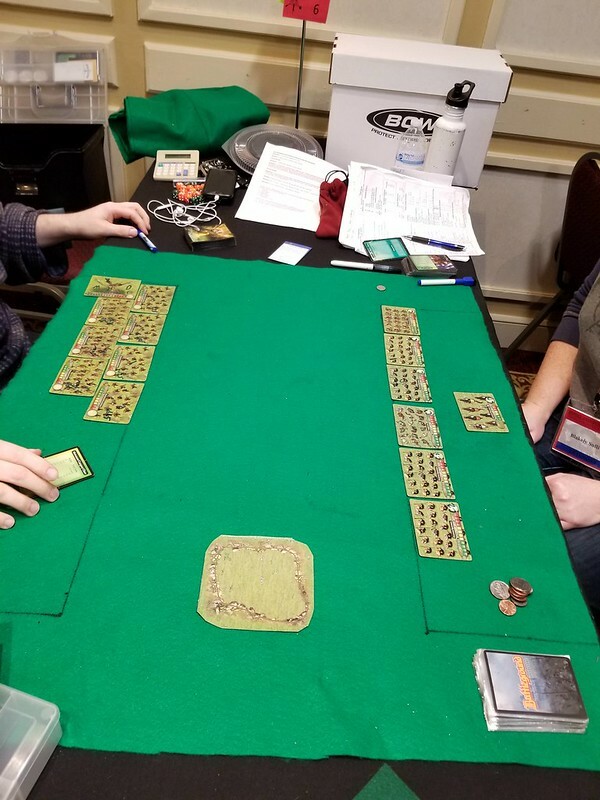 After losing a close one to Blakely the day before, I decided that I was going to dedicate my self to fighting more like elves. I took 3 archers this time and fully planed on using spirit guidance like crazy. I wanted to make holes in her line as soon as possible and give her a real threat on one of her flanks with the Treant. My swordsmen had to hold as long as possible to make my plan work. I set there approach at 1.25" on close so I could get the most shots prior to engagement. On my right flank I was more out matched so I used a few command actions to delay the engagements. Those Dwarven spearmen are a scary unit. It's hard to wear them down and they have seven hit dice for a long while. (6 + the rune) Not to mention, that Blakely loves the unit. She was using anywhere to 2 to 3 of them in her builds over the weekend. I'm also sorry I told her that I liked the Antonians when the weekend started. She ended up using one in BOTH of our games. It's a unit you must account for, and it happens to be murder against elves. (6 offensive skill and impact hit). Anyways, my shooting eventually wore her army down. I wouldn't of had a chance to do that if my treant perished against a pinch. I got lucky and routed off a unit of axemen on her turn by doing 4 damage on the charge turn. Then on my turn I engaged her Antonians and they didn't last long. I did have two hardened cards with a aspect of Oak and a mettle in my hand. Even if she pinched me, the Treant would of been really hard to kill quickly. As usual it was a fun game against Blakely and it was off to the finals against Kevin. I swear I took more pics of this game. Apparently I didn't. Anyhoo, the Treant driving off the Axemen on the initial combat was a huge determining factor in the game. As he said above, the Treant would have held up really well if the pinch happened but it didn't come to that. Kudos to Blakely for making such a fine run this year. And kudos to Brook for having the stones to slap 700 points worth of Archery on the map vs. Dwarves!